Booking Fee Waived. Book regular service anytime without paying the booking fee. $10 Birthday Credit. Happy Birthday from us. Save $10 off any service during the month of your birthday. Private Facebook group with unlimited access to questions and suggestions about skin care and products. 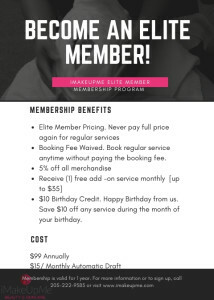 Guidelines: iMakeUpMe Beauty & Skincare Elite Membership program provides savings based on anticipated use. Memberships will expire 1 year after the date of purchase. There are no refunds, credits, or cash given for “unused” memberships. You must purchase membership package in order to receive membership perks. Membership is not to be shared. Membership is nontransferable. Members must use their birthday credit during their birthday month.